It’s been a hot, dry summer in Southern and Central Alberta and up until a few weeks ago trout fishing was slower than normal across the province due to these conditions. Meanwhile, a slight cooling trend in recent weeks and a few rain showers has provided enough relief to kick-start the bite in a few mountain lakes. Shorter and cooler nights are expected to maintain the positive trend. Being a holiday weekend (three-day weekend) there was a lot of traffic the past few days in the foothills above Rocky Mountain House and Caroline. Roughly three hours from Calgary and Edmonton, we spent the yesterday evening tossing salmon eggs to brook trout at Peppers Lake. Fortunately, we waited until late in the day as droves of vacationers were driving out of the forested area. While there were still a few people fishing most had retreated back to their work lives by the time we launched our pair of small boats equipped with electric trolling motors (no gas powered are permitted). If you don’t mind a long drive on dirt (well maintained) Peppers is a great place to bank fish, cast from a pontoon boat, canoe or a small aluminum. It’s situated in a stunning valley, is quiet and loaded with willing brook trout. The lake is managed as a put-and-take fishery, meaning there are no bait restrictions and anglers may keep five brook trout. Brookies are the only species available. Peppers doesn’t normally yield large brookies. Although rumors swirl of 14-16 inch fish, we found most to be 10-12, which is still a blast on light tackle. 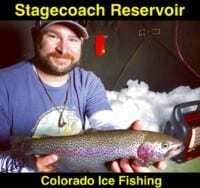 The fish are a great resource for those camping at the lake. Their pink meat tastes great right out of the skillet. Catching trout normally isn’t a chore. The Alberta Fish & Wildlife keeps the lake well stocked. If you’re going to fish from the bank, the area adjacent to the campground provides the easiest and best access to the fish. Anywhere you can walk down to the bank affords the opportunity to catch brookies. The best spot is at the end of the campground, on a dirt area near a bench (you can’t miss it). You’ll find enough space for a few guys to cast here and likely easy limits. Fishing near the boat ramp is normally poor in the summer due to shallow water. If you have a boat or small watercraft, count on easy limits. While we came armed with FireBait and eggs, we didn’t fish the dough bait. At this time the weeds were too thick for the dough. Floating salmon eggs enabled us to drift above the weed line in search of feeding trout. We soaked Orange Deluxe and Yellow Jacket salmon eggs (three per hook) exclusively and caught an endless number of fish while filming Pautzke Outdoors in a few short hours. The key was depth. It’s important to locate drop-offs and target those deeper sections. Our success came with a slip bobber rig. For the most part we set our bobber stops at roughly 10-15 feet. The active trout were deeper than many would expect and while you might have to experiment with depth changes once you find the right number getting bit won’t be an issue, at least it wasn’t for us.